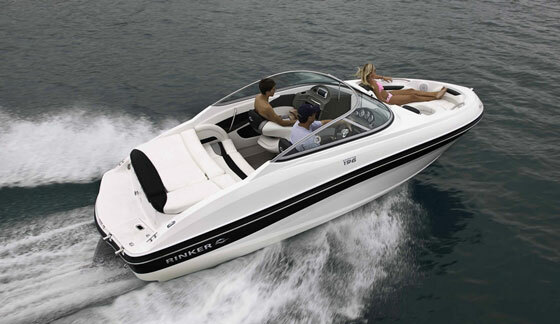 Rinker’s Captiva 170 OB packs a lot of fun into a small package. 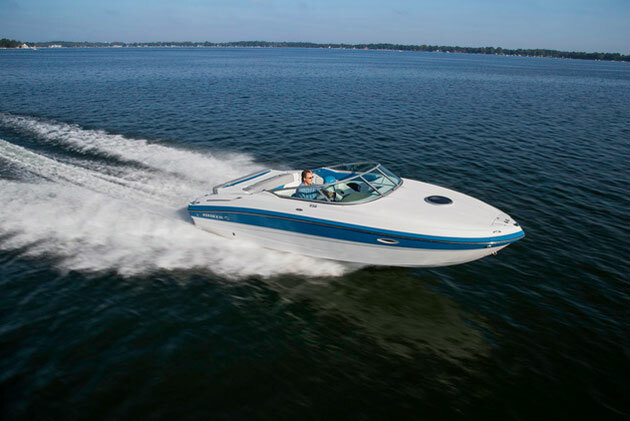 When it comes to outboard powered bowriders, it’s hard to argue against small, light and nimble, and the new Rinker Captiva 170 OB has all of these traits in abundance. What it does not have in abundance are creature comforts—and that’s OK. 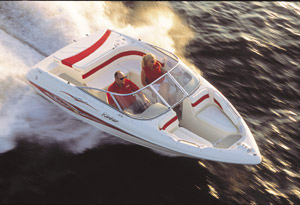 The Rinker 170 OB is thoroughly simple, and thoroughly inexpensive. It does come in a choice of eight gelcoat accent colors, none of which cost extra, which is refreshing on an entry level model like this. The boat also comes with contrasting interior colors that match the exterior, also at no additional cost. But beyond that, the boat is just about as bare-bones boating as it gets. Heck, it doesn’t even come standard with a stereo. I can live without a stereo and most of the time I leave mine off anyway, but I think that’s a serious omission, especially given the nearly $30,000 base price. (The good news is that the optional stereo is only about $200.) 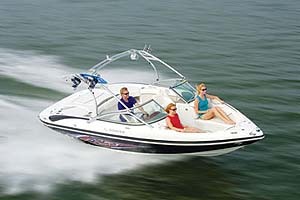 A Bimini top is available in black only and will cost an extra $900. 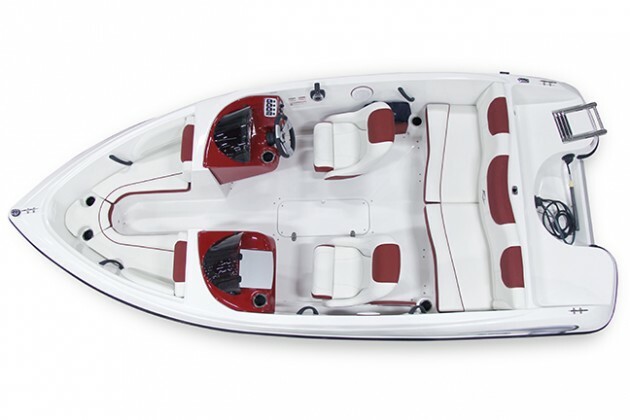 It’s also offered as part of the Deluxe Sports Package, which, in addition to the Bimini top, includes carpet, a depth gauge and tilt Steering, all for $1,559. 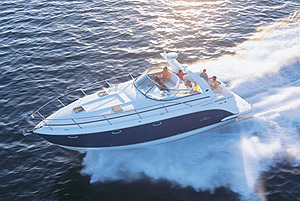 If you opt for the Suzuki 90 horse engine instead of the standard 90 horse Yamaha, you can drop the base price to $28,017 and nearly pay for the Bimini. Ninety horsepower is 90 horsepower, right? And with a wet weight of just 1,890 pounds, 90 horsepower should be plenty. 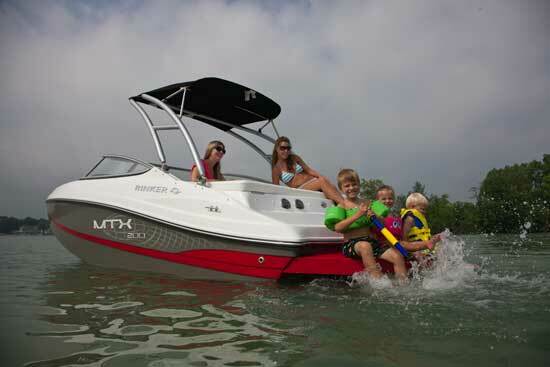 That low weight also means you can tow the Rinker Captiva 170 with practically anything. Even a base model cute-ute like a Toyota RAV4 or a Hyundai Santa Fe would pull it just fine. In standard trim, the Captiva 170 OB looks good inside as well as out. 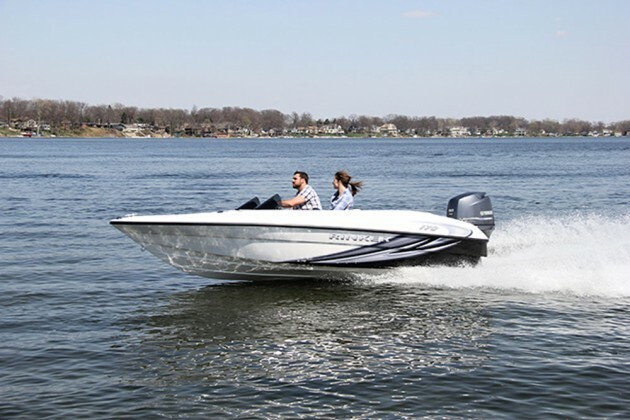 You can get it with an optional windshield, but boats like this kind of cry out for the wind-in-your face setup with a fairing on each side, and those are standard equipment. 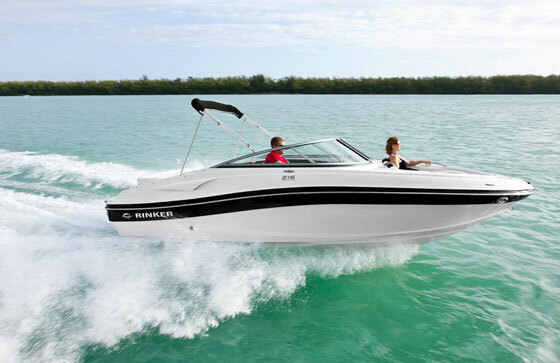 Sure, you could decry the lack of creature comforts in the Rinker Captiva 170 OB, but that belies the nature of this boat. It’s for people who want to get out on their local waterways in something that isn’t so big and cumbersome that it becomes a chore to use. It’s easy to tow and stow, priced competitively, and powered appropriately in standard trim. It’s hard to argue against that. Other Choices: Other small, simple bowriders of interest will include the Ebbtide 176 SE, the Taho Q7i, and the Bayliner 175. See Rinker bowirder listings. For more information, visit Rinker.